Blooming Bath Petals Baby Washcloths - Turquoise | The Best Selection of Innovative Bath Time Necessities for Babies Online! 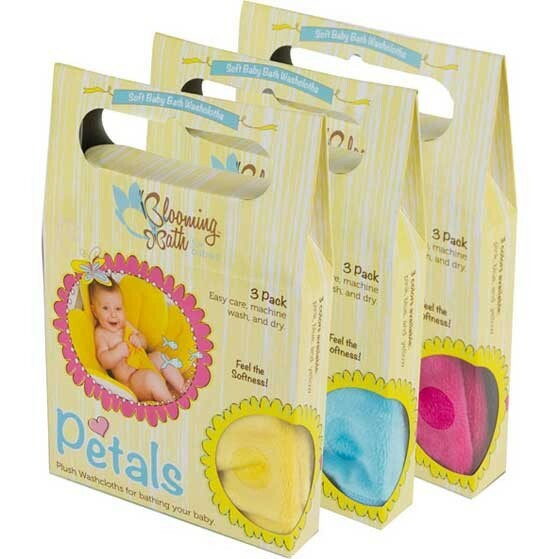 Introducing Blooming Bath's latest baby products - Petals Baby Bath Washcloths! These super soft washcloths were conceived during production of our Blooming Bath for babies bathing tubs. Keeping with our mission to make bath time as fun and comfortable as possible by making everything that touches your baby soft and cozy, these Ultra-Plush Petals were a perfect fit! Made of the same luxurious polyester plush cloth as the soft tub layer of the Blooming Bath, we came to discover that the petals make perfect bathtub accessory. Babies love them against their skin and what parent doesn't love a clean, smiling, happy baby? All materials used in Blooming Bath Petals have been tested and are approved for use with babies. We are committed to reducing our carbon footprint by better management of raw materials and reducing waste. The softest Blooming Bath accessory. Constructed from plush polyester cloth.